If it comes to percussion music, there are not much real good compilations released on CD. That is a pity, because it is such a spectacular genre, with so much great tunes. The original records are often hard to find; much of my favourite tracks I only know from Xth generation cassettes, that I got from fellow collectors. But you won’t hear me complain: while I am typing this, there is such a tape playing in the background and there is nothing wrong with cassette tapes. Once I was in a record store in Belgium, where they played an incredible good percussion song. I asked what it was and it turned out to be a CD, that had just came in. “I would love to buy that CD!” , I said to the guy behind the counter. 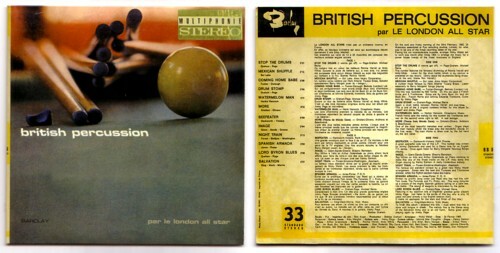 “We only got three copies and it is very expensive.” To make a long story short: I put the other records back, that I intended to buy before I heard this CD, and went home with “British Percussion” by The London All Stars. The guy behind the counter had told me that it was an LP on Barclay, made in the late 60’s. For miraculous reasons, it was never released. There existed only one copy and somebody had pressed a limited edition CD of it. When I came home, I played my new found treasure and, after the incredible track that I had already heard in the shop, I felt more and more disappointed with every of the nine other tracks that came out of my speakers. How could I be so stupid to pay so much money for such a boring rubbish? And why did I pay so much for a CD anyway?! And how dare somebody ask so much money for a CD with such a lousy sound quality?!? I played the openings track a few times and then I lost sight of the CD. Today it came out of the closet again, while I was searching for another CD. If I forget the money and the nine other songs on it, this is a hell of a CD!